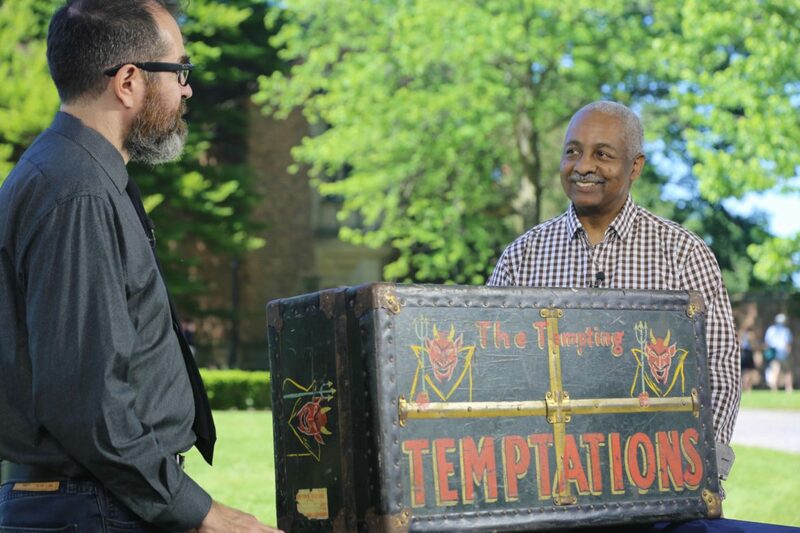 Gary Piattoni, left, appraises "The Temptations trunk," a collectible brought into a Roadshow taping at Meadow Brook Hall in Rochester, Mich.
A PBS series designed to deliver moments of genuine surprise has a new one in store for viewers come January. The 23rd season of Antiques Roadshow introduces a new format of appraisals filmed in and outside historic locations. The change complicates the production but adds a new twist and visual appeal. PBS and stations have long relied on Antiques Roadshow to attract and retain viewers in prime-time and repeat airings. 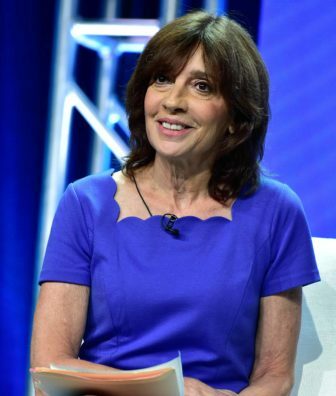 Roadshow leads PBS’ schedule on Mondays, delivering two back-to-back episodes on the second–most-viewed night of the week, but its average season ratings have been slipping, according to a recent analysis by TRAC Media Services. Producers and programmers are hopeful that the format update will turn that around. The decision to begin staging the Roadshow in outdoor locations took time to implement. Two PBS executives who worked with Bemko to make it happen — Beth Hoppe, chief program executive, and Mike Kelley, programming SVP for business affairs and content operations — both departed for other jobs this year. Producers of the original Antiques RoadShow at the BBC also advised Bemko’s team. Even so, the added complexity of production hasn’t altered the number of episodes to be delivered; Antiques Roadshow is producing 26 new shows, including its 500th episode, for season 23. The number of cities included in a Roadshow tour typically determines how many new episodes will air in a given season, according to Demee Gambulos, publicist for the show. A five-city tour typically results in 24 to 26 new episodes. Programs in the 23rd season were filmed at Churchill Downs in Louisville, home to the Kentucky Derby; the historic Hotel del Coronado resort in San Diego; the Philbrook Museum of Art in Tulsa, Okla.; Meadow Brook Hall, outside of Detroit; and Ca’ d’Zan, the John and Mabel Ringling Museum of Art in Sarasota, Fla.
For the 2019 tour that begins in April, Antiques Roadshow will travel to the Desert Botanical Garden in Phoenix; the McNay Art Museum in San Antonio; the Crocker Art Museum in Sacramento, Calif.; Bonanzaville in Fargo, N.D.; and the Winterthur Museum, Garden & Library in Winterthur, Del. Episodes produced from this tour will make up the 24th season debuting in 2020. The new format also incorporates interviews with appraisers, an element that Bemko is testing, and the short “snapshots” that have already worked to improve pacing of each episode. Producer Adam Monahan scours the crowded venue in search of items “that are cool and totally entertaining,” regardless of their appraised value, Bemko said. The heart of each program remains the expert appraisals of the variety of antiques, collectibles and memorabilia that locals bring to Roadshow tapings. Each two- to three-minute segment connects a Roadshow visitor’s story of family history or discovery to American history and culture, building up to a big reveal of an item’s estimated value. “This is History Channel meeting Who Wants to Be a Millionaire,” said Leila Dunbar, a sports memorabilia expert from Washington, D.C., and Roadshow regular who appeared on the very first episode in 1997. Antiques Roadshow is one of the building blocks of PBS’ broadcast schedule, drawing a cumulative audience of 8 million viewers each week, according to Nielsen data cited by Bemko. “It is the most watched ongoing prime-time PBS series and one of the few shows in the PBS schedule for which the viewer knows exactly what to expect each week,” said Ron Bachman, senior director of programming at WGBH. But its 1.66 household season average from the 2017–18 season marked a 5 percent drop from 2016–17, according to TRAC Media’s analysis, presented during American Public Television’s Audience Summit last month in Baltimore. TRAC examined season-to-season averages for all PBS prime-time series and pointed to declines in Monday-night viewing as a source of concern. Kristen Kuebler, director of client services, noted that the household seasonal average for Antiques Roadshow had declined 21 percent since 2012–13. A conference attendee asked why the show was losing viewers. Also, Roadshow’s ratings don’t get much of a boost from time-shifted DVR viewings, York said. Indeed, TRAC Media’s analysis showed double-digit ratings declines for all but four prime-time series: Finding Your Roots, American Masters, Great Performances at the Met and Secrets of the Dead. Those series have limited footprints in PBS’s national schedule. Seasonal household averages for Independent Lens and POV, the independent film series that follow Antiques Roadshow in the Monday-night feed, are down 21 percent and 6 percent, respectively. Antiques Roadshow is popular with donors, and the production tour offers stations special opportunities to build relationships with those fans, according to station managers. A small number of tickets to each local event are set aside for host stations to use in their fundraising. Jasmani Francis, left, appraises Topps baseball cards from 1954–56 during a Roadshow taping at Ca’ d’Zan in Sarasota, Fla.
Two stations that hosted the 2018 tour made the most of it by hosting special events when the tour came to town. The Roadshow’s visit to Churchill Downs coincided with a celebration of KET’s 50th anniversary, said Todd Piccirilli, senior director of marketing and communication at the Kentucky network. The episodes taped at the racetrack will premiere in May, creating a fresh tie-in with the 2019 Kentucky Derby, he said. “We look forward to doing community preview events,” he said. Roadshow’s relationship with member stations is mutually beneficial, Bemko said. “We need them,” she said. “They have to recruit 125 volunteers. Their promotion team works with us to do a lot of advance work. They really work hard to make this a success.” In exchange, Bemko appears at an event on behalf of the host station. The production tour draws people to events that are unique to local public television stations. Those opportunities have made Bemko instantly popular with attendees at the PBS Annual Meeting, she joked. Now the hunt for outdoor venues offers a new way to land a tour stop. Senior Editor Dru Sefton contributed reporting to this article. One complaint accuses them of auction misconduct. Hate the new format! VERY dull! You’re losing watchers. This format misses the mark. Part of the charm was the people carrying around their treasures, looking on as other participants were learning about there treasures. It made you feel as though you might own items that could be valuable. I’m afraid it’s not fun to watch any longer. I’m sorry. Coming up segments seems to to be the fashion in all programs these days what is the point it spoils the whole program and I have to record everything these days to whizz through this rubbish. Two things I like about the British version. They have had appraisers bring in their favorite collectible from their personal items at home. Entitled something like, “If you could only grab one item from your house, what would you take?” Also a quiz type segment with the host as the contestant. They have 3-4 items that have had past appraisals and the host has to guess which item has increased, which has decreased and which has stayed the same over the past so many years. Or they’ll show 4 items of glassware, all similar and the host has to guess the values, which is worth the most through the least. These shorty choppy segments are horrible to me. It’s like I can’t care enough about the object being shown because I’m not given enough time to connect with the object, if that makes any sense. On the BBC they spend a lot more time on all the items on the show. Their host does a quick intro of the city they are visiting at the beginning, then onto the show. I’ll never stop watching the show, but I definitely didn’t care for the new format at all. The episode at a mansion, I think Rhode Island, there was so much of the location talked about , I assumed it was a poor turn out and there weren’t enough interring items to air. The new format is awful. It is a mistake to foreground settings – that aren’t all that interesting over the objects being appraised. And why don’t appraisers even have a table on which to place the object? If you want to maintain – or increase- the number of viewers, think of something different, like featuring collectors of interesting objects, or regional museums with objects like American art pottery, or regional painting. This season, the program gets worse each week. I used to support PBS stations because of this show – if I continue to do so, it will be in spite of it. Now I look for channels with the British antiques shows, which still believe that ordinary people can appreciate extraordinary objects..